Google Canada’s managing director Sam Sebastian spoke about Google’s partnership with the Toronto Public Library to create the wifi hotspot rental program. Photo by Anders Marshall. According to Mayor John Tory, Toronto has a culture of “haves” and “have nots”: those with privilege, with access to resources and services—and those without them. It’s our job, the mayor told a crowd at Thorncliffe Park’s Public Library branch last month, to bridge that divide. “I believe the best thing to do is build people up, to allow them to be everything they can be,” Tory says. Among the resources unavailable to many is access to internet. The city has a Wi-Fi problem: though it is a necessity when it comes to job searches, education, and employment, many Torontonians cannot afford home internet packages. 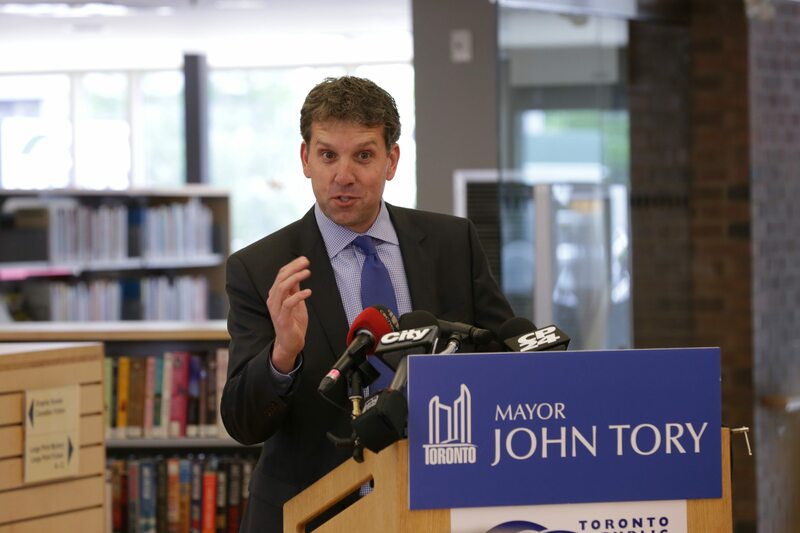 In an effort to improve access, the Toronto Public Library has begun a partnership with Google Canada to create a Wi-Fi hotspot rental program. The program completed its pilot phase in June, beginning with 210 individual mobile units. Aside from Thorncliffe, branches participating in the program include Albion, Cedarbrae, Evelyn Gregory, Parliament Street, and York Woods. Users can rent hotspots from any participating branch for six months at a time, and are allocated 10 gigabytes of data to use each month. City Librarian Vickery Bowles said the City and Google went Dutch on the cost of the pilot stage, investing $100,000 each. Sam Sebastian, managing director of Google Canada, says Google has “literally gone to the edge of the earth” to provide internet access to those less fortunate, but has yet to fix the problems in its own backyard. Sebastian’s sentiments touch on a greater issue within the GTA, but the program is only a first step in solving Toronto’s Wi-Fi problem. In February, advocacy group ACORN called for more affordable internet access in the city. A survey conducted by ACORN found that many low-income Canadians dip into their budgets for food, rent, and recreation to pay for internet. The pilot project can help those like Riaz Qureshi, a physician from Pakistan studying for his Canadian medical licence test in September. He was among the first beneficiaries of the program, and had been using his hotspot all over the city throughout the day, during breaks from work to study in nearby parks. Qureshi says the hotspot made him feel “relaxed” about his studies, as well as the rest of his family, who also use the hotspot to do homework and prepare for exams. But for several others who live without internet access, or those who forgo food to purchase internet packages, it’s not nearly enough. Alejandra Ruiz Vargas, a spokesperson for ACORN, says the pilot program’s impact isn’t large enough to merit the investment. “It’s a good effort, but it would be better if internet was considered a utility, meaning it would become a more affordable option for more low income citizens,” she says. Instead, Vargas adds, Canadians would be better off if internet if legislation deemed internet a utility, thus lowering costs across the country. Vargas also criticized the pilot project’s relatively small data cap, and the six-month rental limit. Instead, Tory says we must challenge telecommunications companies to do what Google has done in partnership with the City but on a larger scale.